The Alfred P. Murrah Federal Building was a United States federal government complex located at 200 N.W. 5th Street in Downtown Oklahoma City, Oklahoma, United States. 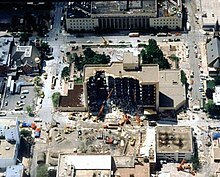 On April 19, 1995, at 9:02 am the building was the target of the Oklahoma City bombing, which killed 168 people, 19 of whom were children under the age of six. Half of the building collapsed seconds after the truck bomb detonated. The remains were imploded a month after the attack, and the Oklahoma City National Memorial was built on the site. By the 1990s, the building contained regional offices for the Social Security Administration, the U.S. Department of Housing and Urban Development, the United States Secret Service, the Department of Veterans Affairs vocational rehabilitation counseling center, the Drug Enforcement Administration (D.E.A. ), and the Bureau of Alcohol, Tobacco, and Firearms (ATF). It also contained recruiting offices for the US Military. It housed approximately 550 employees. It also housed America's Kids, a children's day care center. In October 1983, members of the white supremacist group The Covenant, The Sword, and the Arm of the Lord (CSA), including founder James Ellison and Richard Snell plotted to park "a van or trailer in front of the Federal Building and blow it up with rockets detonated by a timer." While the CSA was building a rocket launcher to attack the building, the ordnance accidentally detonated in one of the member's hands. The CSA took this as divine intervention and called off the planned attack. Convicted of murder in an unrelated case, Richard Snell was executed on April 19, 1995, the same day the bombing of the federal building was carried out, after Associate Supreme Court Justice Clarence Thomas declined to hear further appeal. Snell reportedly spent his last day watching news coverage of the bombing and laughing to himself. 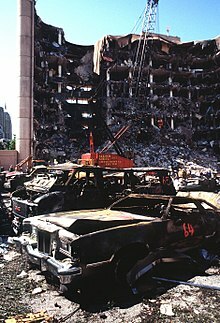 At 9:02 a.m. local time on April 19, 1995, a Ryder rental truck, containing approximately 7,000 pounds (3175 kg) of ammonium nitrate fertilizer, nitromethane, and diesel fuel was detonated in front of the building, destroying a third of it and causing severe damage to several other buildings located nearby. As a result, 168 people were killed, including 19 children, and over 800 others were injured. It remains the deadliest domestic terrorist attack, with the most property damage, on American soil. Palm Tree Coil, Bronze sculpture by Jerry McMillan. An untitled acrylic sculpture by Fred Eversley was severely damaged, but survived the blast. ^ a b Binomial.com Archived 2011-09-10 at the Wayback Machine, Phoenix Disaster Recovery Newsletter: Retrieved 2001-03-29. ^ "Architect Says Bombed OK Building was Solidly Built". Transcript # 635-35, 7:07 pm ET, Interview by Linden Soles with Wendell Locke. CNN. April 19, 1995. ^ "Car Bombing In Oklahoma City Jolts the Nation". All Things Considered. NPR. April 19, 1995. ^ Thomas, Jo; Smothers, Ronald (May 20, 1995). "Oklahoma City Building Was Target Of Plot as Early as '83, Official Says". New York Times. ^ "White Supremacist Executed For Murdering 2 in Arkansas". New York Times. April 21, 1995. ^ Irving, Clive (1995). In Their Name. New York: Random House. ISBN 0-679-44825-X. ^ "mcveigh.book.01". CNN archives. CNN. March 29, 2001. Archived from the original on February 27, 2011. Retrieved June 5, 2009. ^ An Oklahoma Tribute (PDF). US General Services Administration. pp. 24, 38–45. Archived from the original (PDF) on 2012-09-26. ^ a b Irving, Clive, ed. (1995). In Their Name (First ed.). New York City: Random House. ISBN 0-679-44825-X. ^ a b Linenthal, Edward (2001). The Unfinished Bombing: Oklahoma City in American Memory. New York: Oxford University Press. ISBN 0-19-513672-1. ^ "CNN Interactive". Federal Building Demolition. Archived from the original on December 10, 2006. Retrieved February 1, 2007. ^ "Oklahoma City National Memorial - Frequently Asked Questions". US National Park Service. Archived from the original on 21 November 2008. Retrieved 2008-12-20. ^ "Structural Integrity". tribunedigital-chicagotribune. Retrieved 19 April 2015. ^ "New Oklahoma City Federal Building: Groundbreaking Set for Tuesday". United States General Services Administration. Archived from the original on 2007-12-19. Retrieved 2007-07-02.